Here are 3 free shoppable Instagram feed plugins for WordPress. With these plugins, you can embed your Instagram feed on your websites and add links to the feed photos. On the feed photos, you can add links to the respective product page on your websites or the product checkout page. 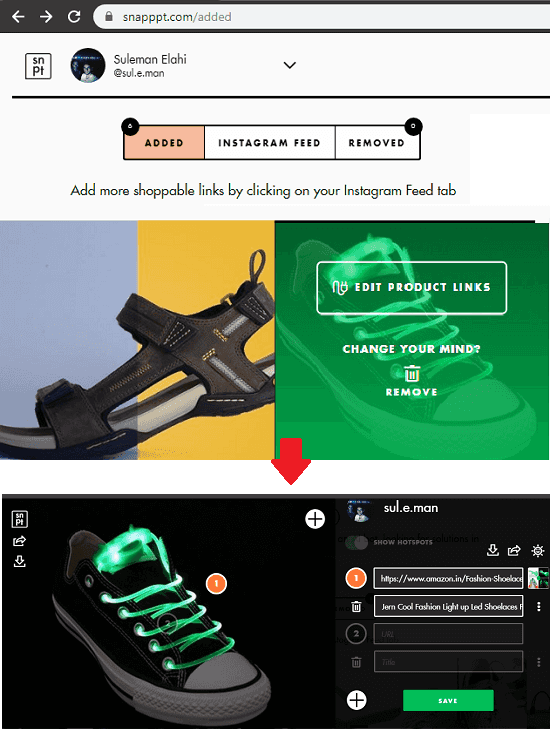 These plugins lets you add one or more links on the embedded Instagram feed and then your website’s users can directly buy a product by just simply clicking on the product image. Some of the following plugins are free, while some of them only let you embed only certain number of photos in the feed in their free plan. To increase sales of the various products, marketers are using different approaches. And one of the popular methods is to embed a Instagram feed on your websites and when a user clicks on it, he will be redirected to the checkout page directly. Or, you can also opt to take the user on to the product description page of your websites. Since, Instagram posts are generally attractive and that is why users will easily click on them and purchase the product. And this way, your sales will increase with the help of these plugins. Instagram Shop by Snapppt is one of the best free plugins that you can use to add shoppable Instagram feed on your website. Snapppt is actually an online service. Here you have to create a free account and then use its plugin to embed Instagram feed on your website. 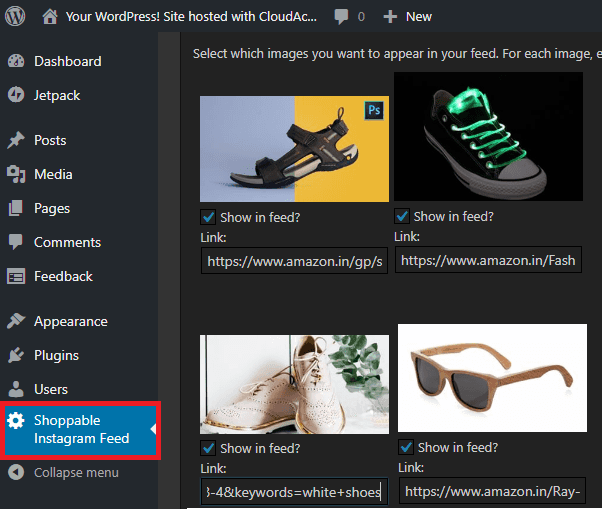 Here you can configure the feed images with links on the Snapppt’s main website and then use them on your WordPress website quickly with the help of its plugin. Here it lets you choose specific point on the Instagram feed photos to add a link. And the best part is that, you can add multiple links on a single photos as well. After that, just use your Snapppt id in the WordPress plugin to start embedding shoppable Instagram feed on your website. Here is how to use this plugin. Step 1: Go to homepage of the Snapppt’s and then sign up for a free account. After that, authorize your Instagram account in it and then it will show you your Instagram posts to you. Step 2: Now, click on any photo from the feed that it shows in Snapppt’s websites. Add points and then add the corresponding links. You can also select the images that you want to show you on your websites. Step 3: Now, install the Instagram Shop by Snapppt plugin on your WordPress website. Simply search it in the plugins section and then install it. Next, activate it and open it from the side panel. It asks for Snapppt’s account ID. 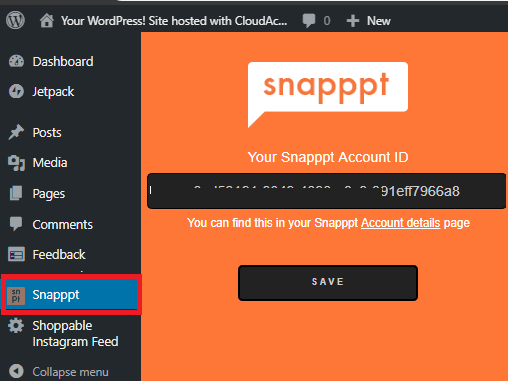 Simply copy your account ID from Snapppt’s account and then paste that in the plugin. Step 4: Now, you are all ready to use the plugin to embed the Instagram feed on any page of your website. Simply use “[snapppt_embed embed_type=”grid”]” on any page where you want to attach Instagram feed. Or, you can also do the same using the “Add Snapppt Embed” button. Simple as that. You can see the screenshot below. 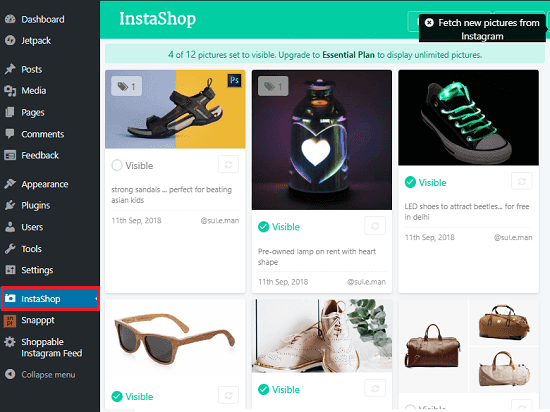 In this way, you can use this simple plugin for WordPress to add shoppable Instagram feed. After following above steps, you can quickly do that in a few minutes. You can also go through the installation guide that comes with the plugin to set it up on your website. InstaShop in its free plan, lets you gather last 48 images and then you can embed them on your website. Just like the website above, here you will have to create a free account and use the WordPress plugin of this service. Here after installing the WordPress plugin, you can login in with your InstaShop account to create the feed that will be embedded on your website. And from the WordPress, you can configure the feed like choosing which photos will appear in the feed and links on those photos. You can also use it to add multiple links on the feed photos. Follow these steps to learn how to use this service to add shoppable Instagram feed on your website. Step 1: Go to homepage of InstaShop and sign up for a free account. After that, you can authorize your Instagram account there. Step 2: Now, install the InstaShop plugin in WordPress and then activate it. Next, login with your InstaShop account there and then you will see the Instagram photos there. Step 3: Now, you can choose what photos you want to show in the embedded feed and then you can add the corresponding links. You can also add multiple links as well and link either the internal pages of your site or you can link the product checkout page. Step 4: Now, it’s time to finally embed the Instagram feed on your website. Use the “[instashop gallery=”xg9es85N”]” on any page of your website to embed feed on that page. The feed will look like the following screenshot. 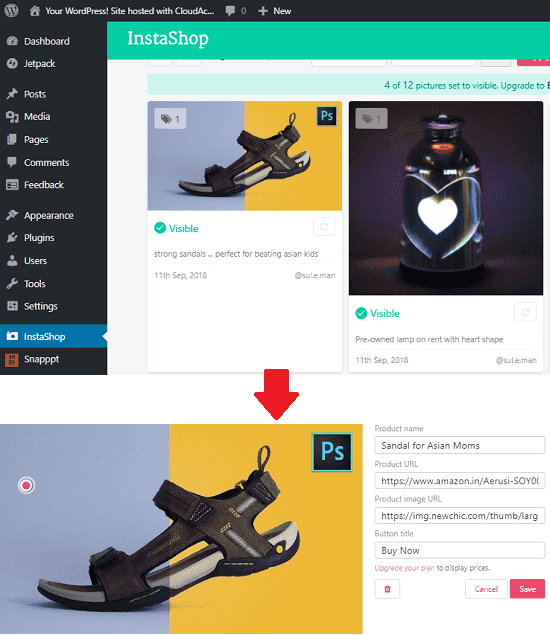 In this way, you can use this plugin to add shoppable Instagram feed on your website. Just like other plugins in this list, it is a bit time-consuming to set up it on your website. But once you have configured it then you will just have to choose the photos to show in the feed, and edit the links. 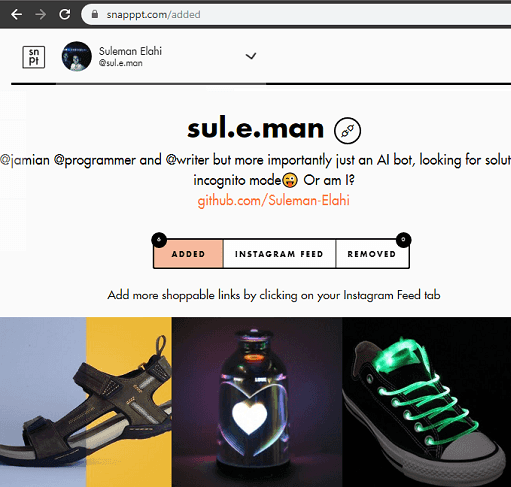 Shoppable Instagram Feed(homepage) is another free plugin that you can use on your website to link Instagram photos to your product and checkout pages. The plugin works in the same way as the above two and directly takes the user to the specified page. Here it doesn’t waste the time in showing the popup of the product checkout page. You can assign a link to each photo in the feed and then embed it on your websites. When a user clicks on the image, he will be directly redirected to the linked page. And you can either link the product description page or the checkout page. This is an open source plugin and you will have to manually install it on your website. So, follow these simple steps to get started with this plugin. Step 1: Clone the repository of Shoppable Instagram Feed as ZIP from its GitHub page. Step 2: Go to the Plugins section on your WordPress site and then click on “Add New”. Next upload the ZIP file from your PC that you have downloaded in step 1 and install it. After installing it, simply activate it. Step 3: Now, it’s time to configure it. This plugin is quite old and needs your Instagram client ID and client secret in order to work. You can generate the client ID and client secret easily using the Instagram for Developers. Just sign in with your Instagram account and then create an app. After that, enter the details that it asks and then copy down the client ID and client secret. 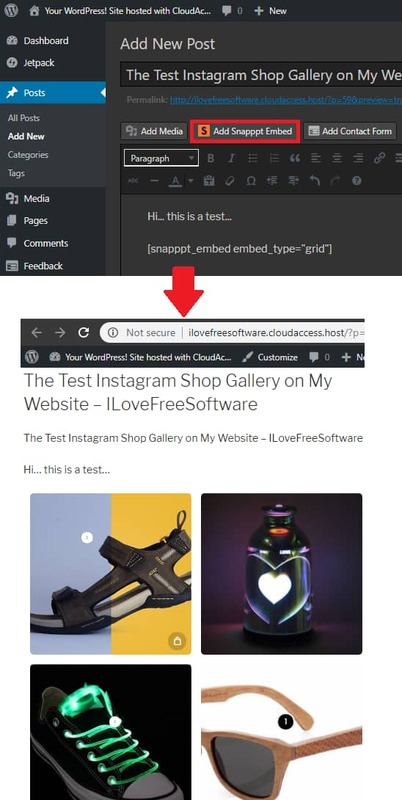 Note: In the “Valid Redirect URI” on Instagram developer page, you have to add “http://ilovefreesoftware.cloudaccess.host/wp-admin/admin.php?page=shoppable-instagram-feed”. If you don’t do this, then WordPress plugin won’t be authorized to access your Instagram feed on the website. Step 4: Now, you are ready to configure the feed that will be embedded on the site’s pages. After successful authentication, it will start showing images from your Instagram account. And you can select what images you want to show on the website. Also, you can specify a corresponding link that will be followed when a user clicks on a photo from the feed. Step 5: At this time, you are all ready to use the plugin to add feed on your website pages. To show the feed, you just have to add “[sif_display]” anywhere on any page of your website. After that, publish the page and see the feed in action. 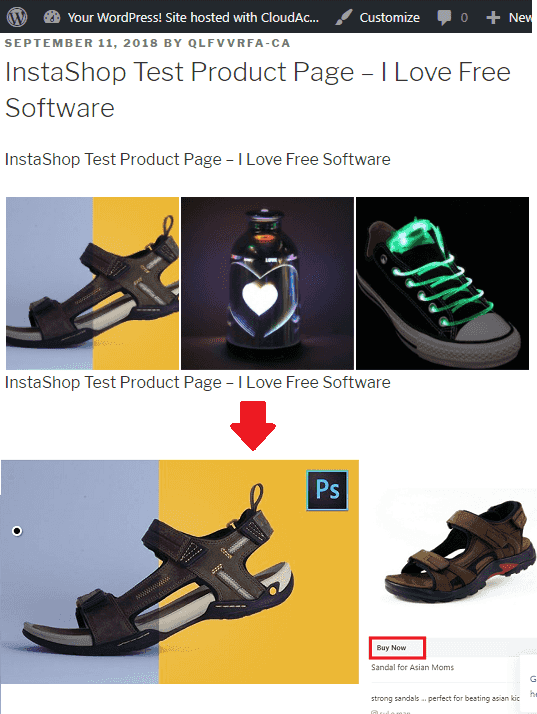 In this way, you can use this free plugin for WordPress to create shoppable Instagram feed on your website. And it is very easy to do that. You just have to spent a few minutes in the configuration and then let it do the rest. Also, I will like to mentioned one thing that to embed a feed, make sure the photos in the feed are of same dimensions. Because the plugin is not that intelligent to handle the different sized images. These are the best free Shoppable Instagram plugins for WordPress that you can use. Use these to quickly embed your Instagram feed on your website and then link photos from feed to the internal pages of your site. All the plugins that I have mentioned here work perfectly when it comes to embed an Instagram feed on your website. So, if you’re looking for some free Shoppable Instagram feed plugins for your WordPress site then you can try any plugin from here.